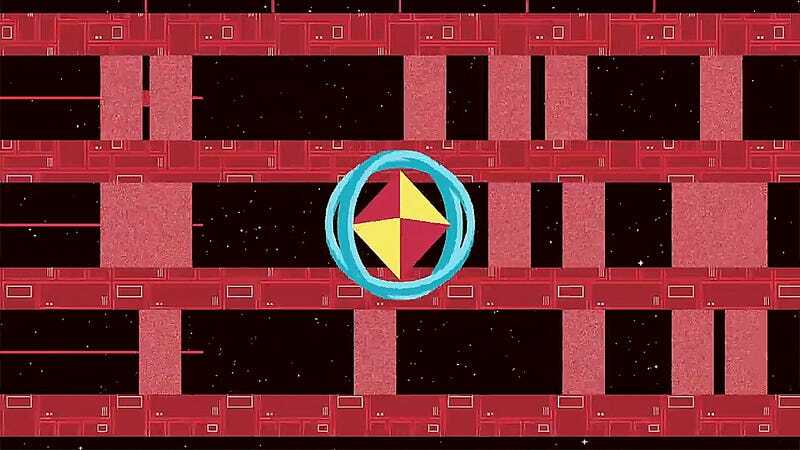 JumpGrid is a mix of bullet-hell dodging, Pac-Man and teleportation. Which might sound like a weird combo, but the mix of fast muscle memory gameplay, puzzle solving and colorful art is really fun and unlike any game I’ve played in recent memory. In JumpGrid, players control a small ship that can teleport to different fixed points. Each level challenges the player to collect tokens that are spread across some of these fixed points, while dodging different shapes that inhabit these colorful levels. These shapes are deadly. Touch one of them, even slightly and you instantly pop out of existence. Luckily, the little ship you control can teleport through these shapes and other obstacles. Screw up the timing of when to move and you could teleport into one of these deadly shapes, which kills your little playable object. It’s a simple setup that takes only a few minutes to fully understand. JumpGrid is one those games where you’ll have a few “Ohhh” epiphany moments. A good example of this is found in one of the early levels. The level looked impossible. I was entirely surrounded by shapes. How was I supposed to beat this level? In desperation, I moved into a direction and to my surprise I was alive. I had learned I could teleport through objects and without a tutorial pop up. Instead, JumpGrid uses smart level design to help teach the player how to play and what to do next. “Jumpgrid evolved out of the idea to instead have multiple dash points at fixed offsets from the player ship,” explained MacLarty. This meant players would have less to worry about and could focus more on moving and dodging. The fixed points help make moving less about small and intricate movements, instead I was focused on timing and dodging. You can even get so comfortable with a level and its obstacles that you stop always looking where your ship is and blindly hit your fixed points based on timing of obstacles. One other wrinkle that JumpGrid has is that players can dart off screen and end up on the opposite side, like in Pac-Man. This becomes a key part of solving later puzzles and would often break my brain a bit. Having to go left to go right isn’t something I’m used to doing at high speed. Eventually I got the hang of it, after dying a lot. JumpGrid is a fast little game with some gorgeous visuals and a snappy movement mechanic. At times playing JumpGrid felt like it was melting my brain, but in a good way. Just a heads up: Some of the levels have bright flashing colors that cover the entire screen. JumpGrid is coming out Febuary 12 on Steam, Itch.io and the Mac App Store. It will cost $5.